Mark out a pitch of 30x15yrds, 2 gate goals are placed 30yrds apart, this distance can be increased to create a more anaerobic work out. Players line up and exercise one at a time. A server (Coach) is infront of a group of players approximately 15yrds away. 5-6 players is needed to give adequate rest in between bouts. 1.The server passes to A1. 2.A1 returns the pass to the server. 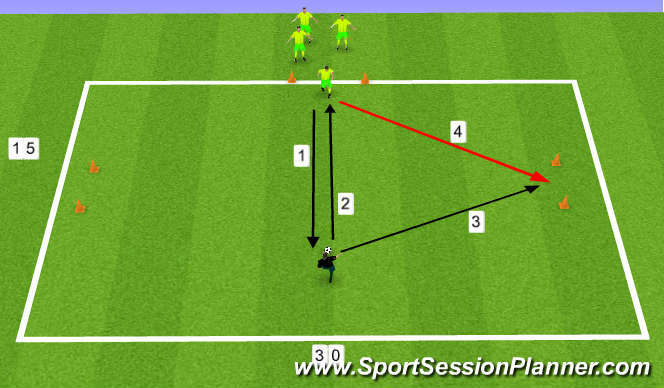 3.The server then plays the ball at pace through either gateway. 4.A1 sprints and attempts to prevent the ball from going through the gate goal. Teams score by blocking the balls from the gates. 1.Encourage players to be on their toes and bouncing ready to react. 3.Slide to block shots on the gate goals. 1.2 players can enter to defend. 2.Server can fake to play one way and then shoot at the opposite gate.